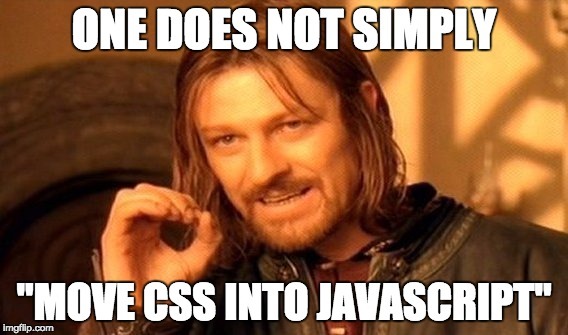 One of the common arguments for "CSS in JS" is that "we thought separation of concerns was important, but look at JSX!". The argument uses this example (which is itself still quite controversial) to argue that clearly separation of concerns is wrong and adding CSS to JS will also improve productivity. Contrast this to graphical properties, which are a very large percentage of what is being manipulated by CSS. Rather than being tightly linked to structure, these are very loosely coupled - this is why one can often wireframe an entire application out before styling it! Moving your CSS into your logic introduces unnecessary coupling, leading to more cognitive overhead not less. The concept of coupling provides another way of thinking about these tradeoffs. It is well acknowledged that designing loosely coupled systems results in more scalability, more maintainability, and easier reasoning. Styling is only loosely coupled with structure - visually similar UI elements can have dramatically different underlying structure, logic, and even behavior. Contrast this to interactive elements, where the logic of interaction necessarily is tightly coupled to the structure it is manipulating. Contrast this to your visual output - if each and every component is completely isolated visually from one another, your site or application will be a disastrous mess! Certainly every component has unique properties, and those properties should be isolated so as not to leak, but there is also a tremendous need for visual consistency across your site. This is one of the core reasons for the CSS cascade, and while a misunderstood and uncontrolled cascade can be disastrous, used properly it is an incredibly powerful tool. Keeping things 'DRY' and having reusable code rather than constantly repeating yourself is generally considered a good practice in software development. It enables fixes and changes to occur in one place, rather than having to be replicated a multitude of places throughout a codebase. It baffles me then, when CSS in JS advocates argue for essentially the "copy and paste" methodology when it comes to styling. As was mentioned above, visual consistency across the various elements of your site or application is extremely important. This means that if every component is itself responsible for its own styling, you will end up with tremendous amounts of duplication! What then happens if your brand changes its' design language? If you want to introduce a new theme, or even subtly tweak your application to keep up with modern design practices? You'll end up having to dig into every single component to implement these changes. In the name of "maintainability", this practice introduces a maintainability nightmare! If you're new to this space, some of the practices to check out include OOCSS, SMACSS, BEM, ITCSS, and ECSS. Each of these has a great deal of thinking behind it, and like any engineering problem there is no 'perfect solution', just different sets of tradeoffs. Adopting any of these practices will improve your CSS and help you find your way out of stylesheet hell. The key is to acknowledge that this is an engineering discipline, and that it deserves the attention and rigor of any other engineering discipline.